In this class, confident beginners will learn techniques for strip piecing and making customer rulers. 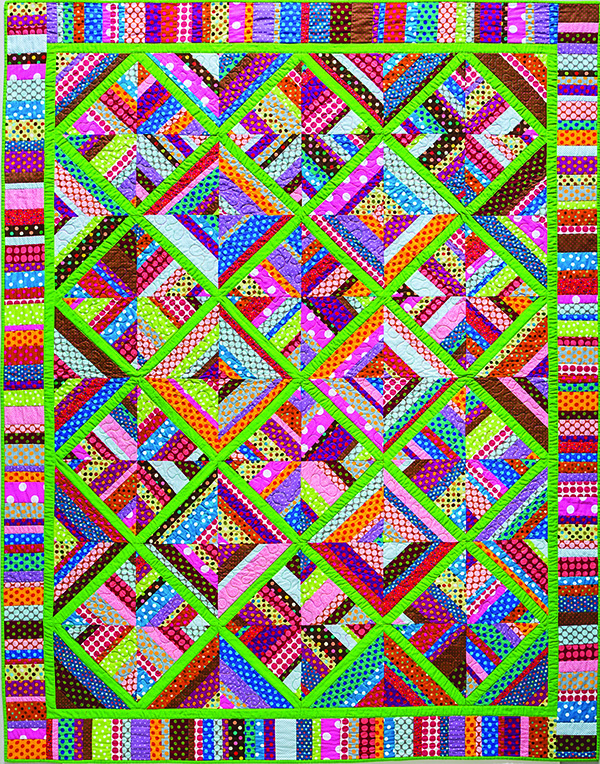 Depending on the length of the class, all or most of the blocks from the Lime Twist quilt can be finished. This is a fun way to play with color and design; each strip set makes two blocks and a border unit! *Fabric quantities will vary depending on which of the four size options chosen from the book. TIP: Feature a shop sample made from fabrics in the shop. Make up fat quarter bundles in various colorways. Offer to cut fat quarters for custom bundles. Bundle the book, ruler, and tape and offer it at a class discount. Set up pressing stations, cutting stations, and extension cords for each work station. Serve Key Lime Pie for dessert of course! 1. Discuss color and design options for the pattern (p. 40). 2. Discuss and demo proper strip-cutting methods (p. 10). 3. Emphasize the SAFETY tips! 4. Discuss and demo sewing the strips and proper ¼’’ seam allowance (p. 12). 5. Give students sewing time to make strip sets. 6. Discuss and demo pressing strip sets and common problems (p. 13). 7. Discuss and demo cutting strip sets into triangles and border units (p. 41). 8. Discuss and demo the ‘twist’ and how the blocks go together with the sashing unit. 9. Make custom rulers by applying the ruler tape ½’’ parallel to either side of the diagonal mark on the ruler. Use these lines to center the sashing strip for trimming the blocks. Demo how this works for trimming the blocks (p. 41). 10. Arrange blocks and discuss layout options (p. 42). Enjoy the variety!